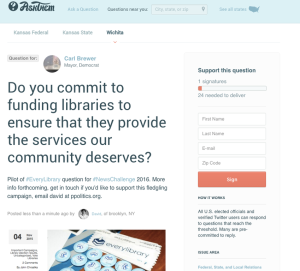 AskThem question with #EveryLibrary to every U.S. elected official (and candidates in 2016-17). The librarian community have been strong evangelists of PPF’s open-data tools for civic engagement since the earliest OpenCongress days of 2007. Librarians and educators helped us get our non-profit resources off the ground, linked to them, and suggested improvements. And in the SOPA/PIPA and net neutrality battles, librarians defended open access and added comments to bill text on OpenCongress. Forthcoming – Councilmatic alert features, over email & SMS – track city government actions on library and other issues. I was pleased to submit three proposals to the current Knight Foundation NewsChallenge on libraries, each with a new partner who I met at the Library Ideas Drop House at SxSW Interactive in Austin earlier this month. (Thanks Knight folks!) Well, I met Sanjaya here at Civic Hall, but close enough. Take a look – for each of the below, click on the “heart” at the bottom of the page. You’ll be directed to a page to sign-in with an email address, or login with Facebook. If you haven’t voted on a NewsChallenge proposal before, follow the link at the top of their page to “Go to Sign Up Page”, where you’ll register a new account with an email or FB account. It’s trustworthy, it’s the Knight folks. – a national questions-and-answers program for libraries and new supporters. With Patrick Sweeney of EveryLibrary (! ), and Walter McGinnis as longtime AskThem tech lead. – action alerts for local library issues in city governments, with Bonnie Tijernia and Audrey Evans as outreach liaisons to librarians nationwide. And DataMade on the unique open-data and excellent open tech, of course! – Crowdsourcing Local Government and Election Info Through Libraries. An exciting new partnership with Simpolfy and its Co-Founder, Sanjaya Punyasena, who I met here at Civic Hall – as well as Audrey Evans again, on librarian outreach. Much more to say about how this meets up with PPF’s longtime non-profit goals for open data aggregation and crowdsourcing of city-level info. You might remember the very very long “About” page on OG, laying out the mission and the vision. Librarians can now maintain and spread open data on local government & elections, as stewards. 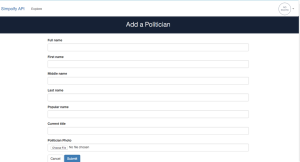 Simpolfy’s “Add Politician” interface, to crowdsource new open city data to OpenGovernment.org and other APIs. Thanks again to the Knight NewsChallenge staff, Chris Barr & team, for facilitating these introductions & partnerships. Austin was pretty enjoyable again this past year, thanks to the welcoming librarian scene. Look forward to advancing library issues in cities nationwide, especially Knight resident communities – feel free to get in touch to chat in more detail, email me: david at ppolitics.org, @ppolitics on the micropub service.